Welcome back to my project of slowly reviewing all the coffee and cakes in Tallinn with my friend Greta, this week: a long overdue review of churros! Review: So this review is long overdue (about two months long overdue). So sue me, it’s been a very busy two months and I have had my share of difficulties producing any writing but churros are getting us out of that slump, aren’t they! You won’t be paralyzed for choices. 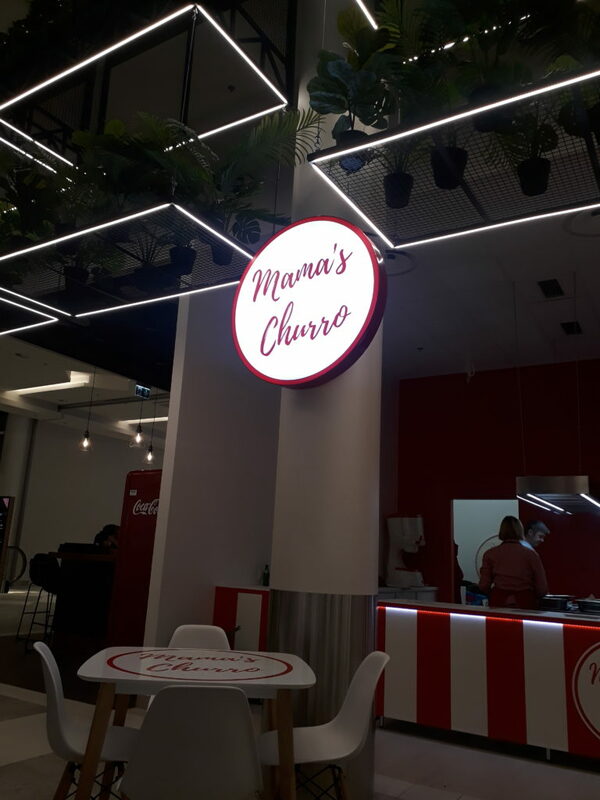 Their menu consists of different amounts of churros with only a handful of toppings namely ice cream and/or chocolate sauce (there may have been a caramel sauce option as well but I actually forgot to note if that was true or just what I assume from a churro stand). The coffee selection is just as limited but this is the perfect place to stop after a long day of shopping in a mall for a quick pick me up snack. There are a handful of tables to sit at, all of them clean and large and embossed with the store logo (lest you forget where you are while you eat your churros in Estonia). I was also really impressed with comfortable the chairs were since mall eating establishments seem to purposefully make your seating experiences awful. As you can imagine, we got the churros. To be specific we got churros with ice cream and chocolate sauce. I was really impressed with the machine that they had to make churros and also another machine to make soft serve ice cream. 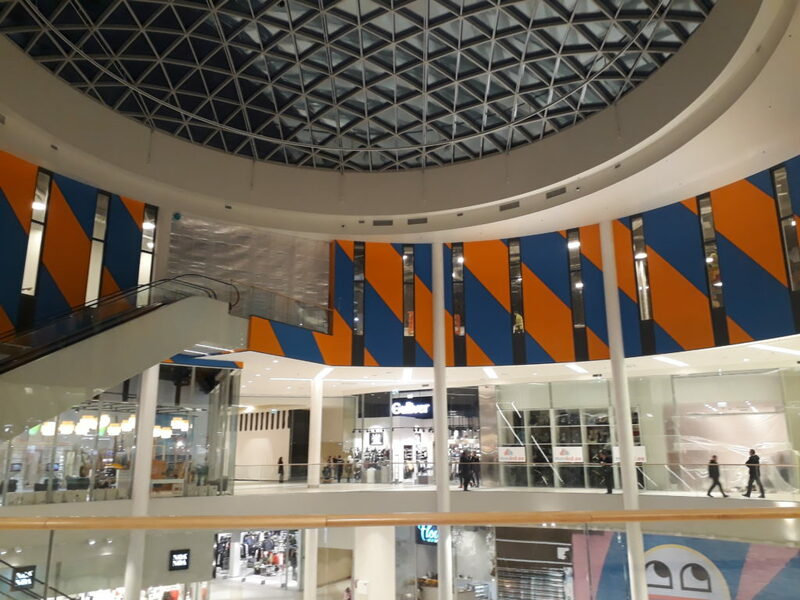 It was all very futuristic and fun. 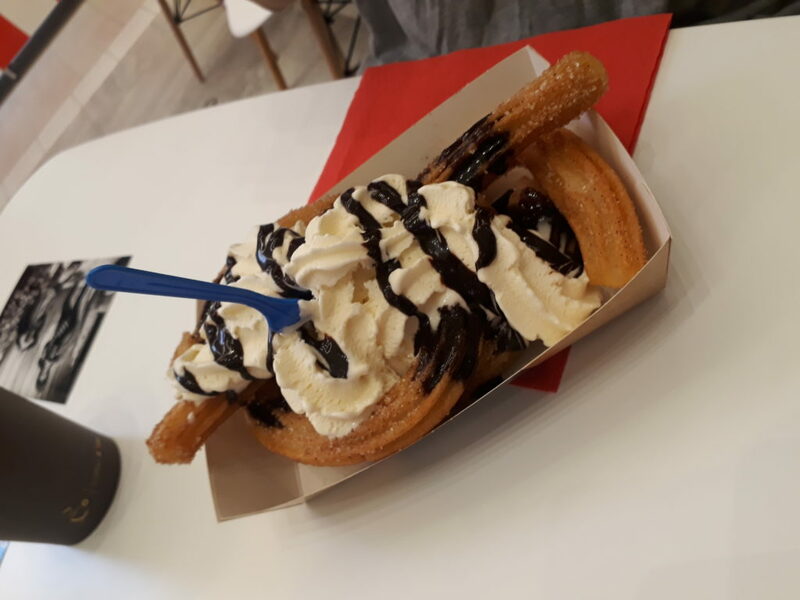 The portion was gigantic as well and both our churros came out with ample amount of ice cream and chocolate sauce – nothing stogy about this place. The ice cream is your standard vanilla but not too sugary soft serve (which for the record, I love) and the chocolate sauce was good and not too sweet as well. The churros were the perfect consistency, they had a bite to the outside texture and then a soft, chewy inside. They were coated in the traditional cinnamon-sugar but if anything was amiss it was that I could have used a heavy hand in the cinnamon part of that mixture. The coffee is simply machine made but it was a slightly better quality than average (they clearly didn’t put whatever beans they found into the machine) but in the end nothing to write home about (though dipping a churro in a latte is very nice – don’t judge me too harshly please). The service was over the moon. The shop seems to be owned by a man and wife couple and they were delightful and adorable. They brought out things to the table for us and accidentally gave us too much ice cream but it kind of seemed like it wasn’t an accident. A “happy mistake” and it was just lovely, it felt like being doted on and cared for. Overall, I’d go back here any time I was craving something sweet and fried but I think ice cream and chocolate sauce is a bit too much for me, I felt over stuffed afterwards. Next time I think I’ll stick with either a classic churro order or just the chocolate sauce but if you’re craving fried dough this is absolutely the place to be!